This webinar, presented by Dr Matthew Page, explains the development and application of the revised tool for assessing risk of bias in randomized trials (RoB 2.0). The RoB 2.0 tool for assessing risk of bias in randomized trials builds on the established Cochrane risk-of-bias tool first released through the Cochrane Handbook for Systematic Reviews of Interventions in 2008 and updated in 2011. The development team have reacted to feedback and evaluations of the original tool and made several amendments and improvements. 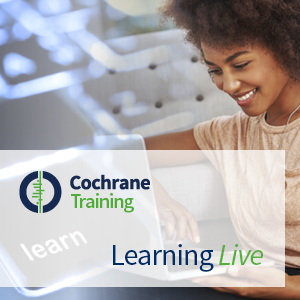 This webinar, which was part of the Cochrane Learning Live series, is presented by Dr Matthew Page, a postdoctoral research fellow based at the University of Bristol, UK. Matthew has expertise in systematic review methodology and bias in biomedical and public health research. Videos of each part are below, where you can also find slides from the webinar as well as the link to the RoB 2.0 website. The authors would like to extend special thanks to: Julian Higgins, Jelena Savović, Asbjørn Hróbjartsson, Isabelle Boutron, Barney Reeves, Roy Elbers and Jonathan Sterne.